Today’s event is about the 26th Peace Road initiative in Korea and I always deeply respect people who are able to design and build roads, especially roads to peace. Generally, to reach something, we have to understand the goal. To me, the most difficult step is to find the way, and then we have to build the road. That is why the problems of transportation infrastructure are so important and close to everybody all over the world. My presentation today is devoted to the problems and prospects of development of the world and especially the transcontinental transport infrastructure. I will talk not only about the Bering Straight tunnel, but also about some wider issues. The population of the earth continues to increase and, in about 40 years according to the forecasts, it will exceed 10 billion people. From the very beginning, humanity inhabited the planet very unevenly. And this unevenness, measured by the difference in the population density, continues to increase. On the other hand, the resources necessary for life and sustainable development constantly decrease and are also distributed across the planet unevenly. However, the distribution of the different types of resources, such as minerals, water, available land, horticulture, forests, etc., varies considerably, and this affects the competitiveness, due to such factors as the availability of labour, the distance from the main markets, etc. Graphs comparing countries by their levels of production and consumption of critical resources per capita show that the difference can reach hundreds or thousands of times. The biggest countries are not always the most successful. The uneven nature of the initial opportunities creates inequality and, at the same time, is an incentive for development. However, too much inequality causes social tensions and does not lead to peace and harmony. The most important mechanism for the use of unevenly distributed resources for the benefit of all countries and, at the same time, for smoothing all the possible conflicts of interest is the world system of trade and transport links. Sea transport is the leading transportation mode, which is understandable given its relative cheapness, developed logistic services and the lack of need to cross the borders of many countries along the road. The main sea routes have long been well known and their main limitations are also well known, such as the low speed of transportation, the need to transit via several physical straights, limited and expensive land available for the development of major ports, and risks of an environmental nature. There is interest in making use of the northern sea route between Europe and Asia, which can reduce the sea distance between Europe and Asia by about one third and the state program of the Russian Federation provides for the creation of conditions for increasing the amount of traffic. However, in general, the leading position of maritime traffic is quite stable and perhaps we should say unfortunate, because land transport remains insufficiently developed and underestimated or undervalued. This form of transport has a much greater potential in terms of its impact on the complex social and economic development of territories and has a number of other advantages. At the moment, the only roads from East to West are the trans-Siberian route and the Silk road, and the time required to get from Moscow to Rotterdam is more than 11 days, while that from Vladivostok to Moscow is 7 days. Border crossings also result in increased delays and problems of taxes and traffic regulations. If we compare overland and overseas transportation, we can see that the positive aspects of the former is that it is faster and that it contributes to the social and economic development along the railroads. Rail links can also provide passenger transportation, competing with air links. However, there are also various disadvantages, such as delays of up to 3-5 days at border crossings. On the other hand, sea transport is cheaper, has a high level of logistic services, strong competition between the basic carriers, and the absence of border crossings. However, it is not always true that sea transport is cheaper, because you have to take into account all of the expenses, such as the cost at the port, the cost to reach the port from the main industrial centres, the change in the mode of transportation at each port, and so on. Rail transportation is always faster than sea transportation and can sometimes be less expensive. If we examine the international rail network, we can see that there are some critical points: some of these problems have been overcome, such as the English Channel and, in some cases, there are plans to overcome the problem, such as the Strait of Gibraltar, the Tsushima Strait, the Panama channel and, of course, my favourite project is crossing the Bering Strait. We can see that if we cross the Bering Strait by tunnel and build the necessary rail links on the mainland, it will become possible to travel from Paris to New York by railroad. More important, however, is that this railroad would allow hitherto untapped mineral and other resources to become available and would allow for the development of these territories. Also, the electric power connections along these roads, would allow for the development of hydroelectric and tidal power stations. Another important project is that concerning the trans-Siberian mainland. It is not a new project, but one that has been discussed for the last 40 years, and the project institute in Russia even had some documentation about this project which crossed the port of Karelia and went in one branch to the trans-Siberian mainland and in the south branch to the China Silk-road or the south branch of the trans-Siberian mainland. This is an example of a project whose political role and role in creating peace between nations cannot be overestimated. To announce some good news, two weeks ago, the president of Russia, Mr Putin, announced the final decision about starting the design and construction of a bridge across the strait between Sakhalin island and the Russian mainland, and I hope that this will be part of the future project continuing from the trans-Siberian mainland through Sakhalin to Hokkaido. The cost of construction of a new railway line is about 7.2 billion dollars. The cost of crossing the Nevelskoy strait, for which the figure is fairly accurate because the economic investigation is now completed, is about 4.5 or 4.6 billion dollars. Then, crossing the strait between Hokkaido and Sakhalin would cost about 15 billion dollars, and you can see that the intensity of the traffic grows if you build both crossings, so I hope this project will be realised soon. If we continue on the subject of the opportunities for mainland transportation, one of the main pieces of good news is the reconstruction and modernization of the main Trans-Siberian railroad. The capacity of this railroad needs to be increased to 200 million tons per year, which means more than doubling its present capacity. However, a more important aspect of this project is reducing the delays at border crossings, because this is one of the main factors slowing down rail transportation. We could also mention the initiative to develop high-speed transportation between the regions of China and Europe via Russia. This would involve the high-speed transportation of not only passengers, but also cargo, at a speed of 300 km/h. Thus, it may become possible to cross this region in 3 to 5 days in the near future. Finally, we should mention the innovation of hyperloop transportation: I’m sure you know about the idea and technical decision of Elon Musk. As far as I’m aware, some big Chinese corporations signed a contract and will create the first hyperloop which will attain a speed of 2,000 km/h. Thus, we can say that investment in infrastructure creates opportunities for peace, for social and economic development and for commercial cooperation between countries. So all of us involved in the leadership of countries have to create opportunities for the construction of transcontinental infrastructures and then I’m sure the world will become a better place. Thank you very much. Dr. Razbegin is a scientist in the field of spatial economy, investment planning, soil mechanics, foundation engineering and underground construction. He works for the Pitirim Sorokin Nikolay Kondratieff International Institute and the International Non-Profit Corporation “Interhemispheric Bering Strait Tunnel and Railroad Group (IBSTRG)” (since 1993). He led the development of large-scale investment projects and regional and sectoral development programmes of the Russian Federation. Since 1996 he has been the Director of the Interdepartmental Centre for integrated regional transport projects. 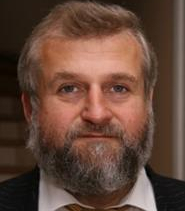 From 1998 to 2015 he was the Deputy Chair of the Council for the Study of Productive Forces of the Russian Ministry of Economic Development and the Russian Academy of Sciences. He is deputy chief editor of Modern Productive Forces.